Every year's end at UC Riverside, the philosophy faculty meet for three hours "to discuss the graduate students". Back in the 1990s when I was a grad student, I seem to recall the Berkeley faculty doing the same thing. The practice appears to be fairly widespread. After years of feeling somewhat uncomfortable with it, I've tentatively decided I'm opposed. I'd be interested to hear from others with positive or negative views about it. Now, there are some good things about these year-end meetings. Let's start with those. At UCR, the formal purpose of the meeting is to give general faculty input to the graduate advisor, who can use that input to help her advising. The idea is that if the faculty as a whole think that a student is doing well and on track, the graduate advisor can communicate that encouraging news to the student; and also, when there are opportunities for awards and fellowships, the graduate advisor can consider those highly regarded students as candidates. And if the faculty as a whole think that a student is struggling, the faculty can diagnose the student's weaknesses and help the graduate advisor give the student advice that might help the student improve. Hypothetical examples (not direct quotes): "Some faculty were concerned about your inconsistent attendance at seminar meetings." "The sense of the faculty is that while you have considerable promise, your writing would be improved if you were more charitable toward the views of philosophers you disagree with." Other benefits are these: It helps the faculty gain a sense of the various graduate students and how they are doing, presumably a good thing. If a student has struggled in one of your classes but seems to be well regarded by other faculty, that can help you see the student in a better light. It's an opportunity to correct misapprehensions. In the rare case of a student with very serious problems (e.g., mental health issues), it can sometimes be useful for the faculty as a whole to be aware of those issues. But in my mind, all of those advantages are outweighed by the tendency of these discussions to create a culture in which there's a generally accepted consensus opinion about which students are doing well and which students are not doing so well. I would prefer, and I think for good reason, to look at the graduate students in my seminar the first day, or to look at a graduate student who asks me to be on her dissertation committee, without the burden of knowing what the other faculty think about her. It's widely accepted in educational psychology that teachers' initial impressions about which students are likely to succeed and fail have a substantial influence on student performance (the Pygmalion Effect). I want each student to meet each professor with a chance to make a new first impression. Sometimes students struggle early but then end up doing a terrific job. Within reason, we should do what we can to give students the chance to leave early poor performance behind them, rather than reiterate and generally communicate a negative perception (especially if that negative perception might partly be grounded in implicit bias or in vague impressions about who "seems smart"). 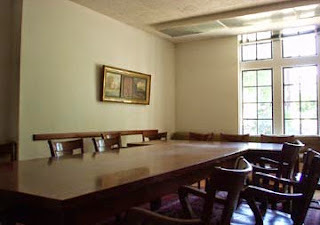 Also, some students will have conflicts with some of their professors, either due to personality differences or due to differences in philosophical style or interests, and it's somewhat unfair to such students for a professor to have a platform to communicate a negative opinion without the student's having a similar platform. I don't want to give the impression that these faculty meetings are about bad-mouthing students. At UCR, the opposite is closer to the truth. Faculty are eager to pipe in with praise for the students who have done well in their courses, and negative remarks are usually couched very carefully and moderately. We like our students and we want them to do well! The UCR Philosophy Department has a reputation for being good to its graduate students -- a reputation which is, in my biased view, well deserved. (This makes me somewhat hesitant to express my concerns about these year-end meetings, out of fear that my remarks will be misinterpreted.) But despite the faculty's evident well-meaning concern for, and praise of, and only muted criticism of, our graduate students in these year-end meetings, I retain my concerns. I imagine the situation is considerably worse, and maybe even seriously morally problematic, at departments with toxic faculty-student relations. What's to be done instead? One possibility is that the graduate advisor get input privately from the other faculty (either face to face or by email), in light of which she can give feedback to her advisees. In fact, private communication might be epistemically better, since communicating opinions independently, rather than in a group context, will presumably reduce the problematic human tendency toward groupthink -- though there's also the disadvantage that private input is less subject to correction, and perhaps (depending on the interpersonal dynamics) less likely to be thoughtfully restrained, than comments made in a faculty meeting. Another possibility is to drop the goal of having the faculty attempt an overall summary assessment of the quality of the students. For awards and fellowships, early-career students can be assessed based on grades and timely completion of requirements. And advanced students can be nominated for awards and fellowships directly by their supervising faculty without the filter of impressions that other faculty might have of that student based on the student's coursework from years ago. And students can, and presumably do, hear feedback from individual faculty separately, a practice that can be further encouraged. As I mentioned, my opinion is only tentative and I'd be interested to hear others' impressions. Please, however, no comments that reveal the identity of particular people.